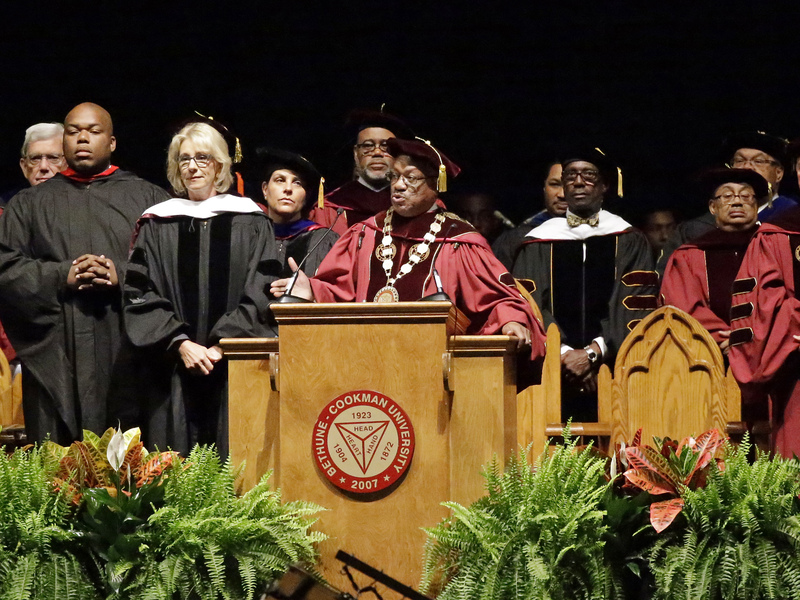 Anyone watching graduates of Bethune-Cookman University in Daytona Beach, Florida, turn their backs on U.S. Secretary of Education Betsy DeVos as she tried to get through her commencement address might judge their behavior rude and disrespectful, especially after some threw boos her way. But reviewing how the scene played out becomes much more complicated when history — that of the university, DeVos and America — is considered. America is a new nation, and a forgetful one. Part of accepting the myth of the American dream, that hard work is all it takes to achieve anything and everything, requires erasing the country’s faults and how it falls short of the promised liberty, equality and justice for all. This episode at Bethune-Cookman has relevance for all graduates of historically black colleges and universities this year. Their protests resonated across HBCU campuses because they know #BlackLivesMatter. 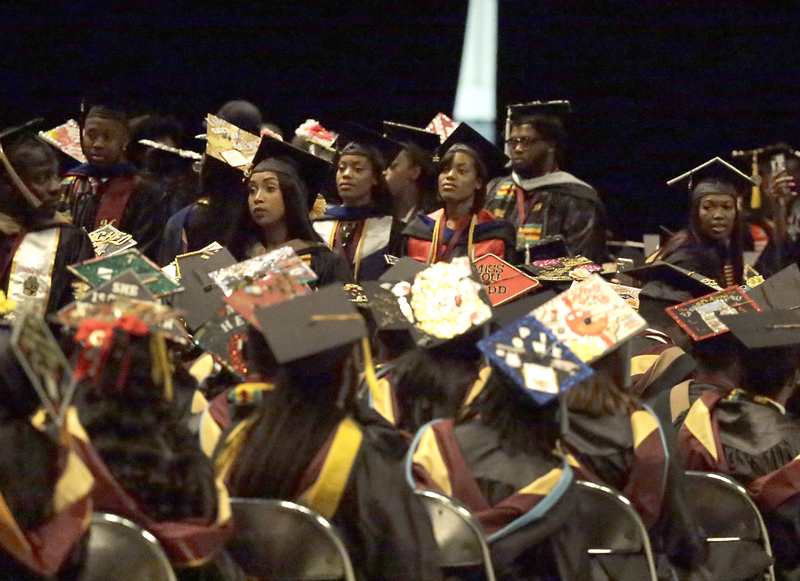 A group of students stand and turn their backs during a commencement exercise speech by United States Secretary of Education Betsy DeVos at Bethune-Cookman University, Wednesday, May 10, 2017, in Daytona Beach, Fla. Her “school choice” metaphor reveals what DeVos forgot or never knew about the history of African-Americans fighting for the right to an education. She instead substituted an Alice-looking-through-the-looking-glass version that conveniently sidestepped the racism, the segregation by law and custom, the exclusion that made always-inclusive HBCUs so necessary. If DeVos traveled to Bethune-Cookman for a forum to learn about the achievements of the school as well as the challenges still faced by the institution and its students, many of whom are the first in their families to attend college, I suspect her reception would have been chilly but cordial. Instead, she was invited with, it has been reported, little or no input from students to receive an honorary degree and share in the school’s glory without doing the work. DeVos came to the university hoping, perhaps, that some of the stature of its pioneering founder, Mary McLeod Bethune, might rub off. But Bethune earned her honored status with a lifetime of civil rights activism. To the predominantly African-American student body, prepared to be resilient when tiresomely tagged with the charge of unearned “affirmative action,” it must have been ironic to see and hear someone who rode her wealth and devotion to conservative causes to her current job, particularly when her solutions to education challenges in her home state of Michigan have mostly been given a failing grade. DeVos is certainly not alone in casting aside inconvenient historical truths. In New Orleans, Mayor Mitch Landrieu’s effort to move Confederate memorials from places of honor to more appropriate venues of contemplation and scholarship is being met with armed resistance and threats. It hardly matters that the first one removed, an obelisk commemorating a murderous uprising by whites resisting racial integration during Reconstruction, was built in 1891, years after the 1874 event, to enshrine the philosophy of “white supremacy in the South,” as a plaque added in 1932 makes clear. Bethune-Cookman University president Edison Jackson, right, appeals to protestors disrupting United States Secretary of Education Betsy DeVos’ speech during commencement exercises, Wednesday, May 10, 2017, in Daytona Beach, Fla. Being clear-eyed to that reality would interfere with the “Lost Cause” myth of Confederate chivalry and righteousness that has long tried to downplay the cruel and inhuman institution of slavery as the cause of the Civil War and absolve the sins of a century of Jim Crow terrorism that followed. There is a continuing nostalgia for an America that never was from those who remain obstinately ignorant of and stand to benefit from its messy history. Polls show that too many Americans believe whites face more discrimination than blacks and that progress is zero-sum — videotaped contradictions notwithstanding. Every February, someone chimes in to ask why America needs a Black History Month, when events reveal the country needs it more than ever. As author Gore Vidal once said, “We are the United States of Amnesia; we learn nothing because we remember nothing.” The wit of that quote becomes tragic when it suits the person in charge of the department whose mission is “to promote student achievement and preparation for global competitiveness by fostering educational excellence and ensuring equal access.” The students of Bethune-Cookman University, with their actions, were telling the education secretary she needs to go back to school.